I just put the last stitches in the binding of my snowflake treeskirt, and the pile of projects waiting to be quilted has officially diappeared. That isn't to say there isn't binding sitting around waiting for a quilt in progress. Those quilts in progress just aren't ready for binding yet. So, here's what I put binding on this past month, besides my son's quilt and the Minions I showed last time. This is a poor picture. That's what I get for trying to have a photo shoot at 10 pm. I'll try to take better ones during daylight hours and share again! I wish I had finished in time to take pictures outside on lovely fresh snow. After the past couple of days I would be taking pictures in lovely squishy mud! The treeskirt pattern will be ready by the end of next week (hopefully sooner) and I'd like to have it tested. There are two sizes for each design. Let me know if you're interested in making one in the next month or so! Beautiful snowflake creations. Wish I had time to test a pattern for you, but that is not my reality right now. That's a lot to get finished in a month! 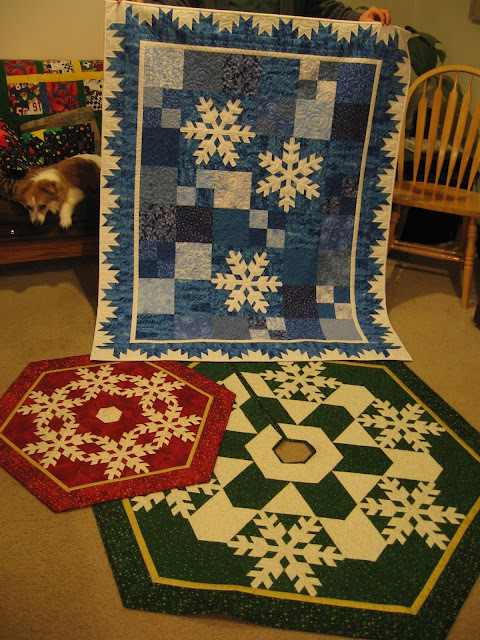 The snowflake quilts are beautiful. Your tree skirts are lovely. I really like the quilt. Absolutely gorgeous; all three pieces! ---"Love"
You've really nailed those snowflakes. Lovely projects and so good to have things finished or just needing binding. Love'em all! If you still need someone to test., I'd be happy to. My favorite is the blue snowflake quilt--love how the border is reminiscent of ice crystals! Congrats on those amazing finishes. I loved seeing your blocks in all three colors. Only 2 years in the making!